Can holiness be enforced? Or rather, can it be forced upon people? Can people be told that by following a set of rules, or by wearing or not wearing this or that, it makes them holy? There is no doubt as to the absolute importance of holiness in the Christian life. To have a personal passion for it and for all involved is more than admirable indeed. But we must go about attaining it properly. We must also recognize what actually constitutes true holiness. I am reminded of Paul’s words in Rom.10:2, as he spoke of his Jewish brethren: For I bear them witness that they have a zeal for God, but not according to knowledge. This must never be the case as we deal with holiness, especially as we do or do not see it in others. When we think that we are rooting out evil and creating an atmosphere of holiness, we are actually creating an atmosphere of fear and uneasiness, and in many cases reduce ourselves to the level of an accidental, unintentional Pharisee. They used their own knowledge of the law to promote their own brand of the law based on their own faulty interpretation of the law. • Mat.23:24 They were so attentive to the smaller details, and the larger, more important matters they swallowed or let go. Matters of the heart are more important, at least as it pertains to holiness, than matters of fashion. Guard your heart, Proverbs 4:23 says, for out it flows the issues of life. This is because, as stated in Mat.15:19-20,…out of the heart proceeds evil thoughts, murders, adulteries, fornications, thefts, false witness, blasphemies. These re the things which defile a man; but to eat with unwashed hands defileth not a man. They were consumed with outward appearances, but Jesus was telling them that the inward man, the heart, was more important. • Mat.23:4 They put the weight of added law upon the people (which was no law at all, because God never said it), and made it too heavy for them to bear-the people simply could not keep it. This is what creates the atmosphere of fear and uneasiness. Is my hair just right? Is my dress or skirt too short—or long? These types of questions and more flood the minds of those under the intimidating gaze of the accidental Pharisees among us. When we begin to move away from what scripture actually says, we become the authority rather than the Word of God. Our ‘authoritative’ word then becomes tradition; which in many cases, though unintentionally, and most unfortunately, supersedes the authority of scripture. Hear Jesus own words in Mark 7:13: Making the word of God of none effect through your tradition, which ye have delivered: and many such like things do ye. Never let it be said that we opt for our traditions over the Word of God. • The Pharisees are a picture of many in the church today–everyone who sees them thinks they are pure, holy and righteous; based on the things they do and say. They have convinced many that they are the model of righteousness and holiness. They have also convinced themselves that they are right and everyone around them who is not exactly like them is wrong. 1. Pointing out the sins of others, effectively shrouding their own. Let God’s Word work; let God be God. God frowns upon our efforts to legislate holiness-as stated previously, when we try to create an atmosphere that we believe God will be pleased with, we instead create an atmosphere of fear and uneasiness—this is not God’s will. • God needs no help – the Holy Ghost will do His work. 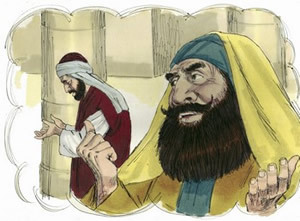 Uzzah thought he was helping God When he touched the Ark (2 Sam.6:6-7). The oxen stumbled; the ark shook, but would it have fallen? Let the power of God do what only it can do. He will protect His holiness. Absolutely. God needs no help. • God needs no help – Moses struck the rock (Num.20:11) when he saw the unholy behavior of God’s people–God told him only to speak. By not doing it God’s way, it cost him his place in the promised land. God will provide in His own way—not ours. He needs no help. • God needs no help – Abram was promised a son by God, but his wife was barren. Sarai suggested that they have a child through her handmaid Hagar (Gen.16:2-4). Because he followed his wife’s advice, he set off a chain of events that the world is still dealing with. God needs no help. God is God all by Himself! Which Banner Are You Under?